With local unemployment at 9%, we are seeing a lot more first time families looking for help. We assisted 4200 families which represent approximately 13,725 adults and children. We provided 60 tons of food and, in addition, we provided Publix gift cards for 400 families at Thanksgiving. This Christmas season, we provided toys for 250 needy children. Make a Financial Donation. make a donation through this website, drop it off at Daystar Life Center or mail it to us at 20428 Cortez Blvd, Brooksville, FL 34601. Make a material donation such as furniture, appliances, housewares or clean clothing that we can sell in our thrift stores. Our trucks are scheduled for pick-ups on Tuesdays and Fridays throughout Hernando County. Please call 352-293-5496 to schedule a pick-up. Come and buy something at our Thrift Shops. We are located ¼ mile on Hope Hill Rd behind St. Anthony’s. Our current hours are Thursday, Friday & Saturday 9:00 AM to 1:00 PM. Become a Daystar Helper. We need help in the office, thrift store and assisting on the trucks (not driving). You can help one day a week for a 4 hour shift. You can also help once or twice a year on special projects. We thank all the people who help us and hope that you are proud of what we accomplish at Daystar. We ask you to continue your support and “help us help others”. "To assist the poor and needy of Hernando County with life's basic needs: Food and Resource Information." Make a Financial Donation. You can make a donation through this website, drop it off at Daystar Life Center or mail it to us at 20428 Cortez Blvd, Brooksville, FL 34601. Make a Material Donation such as furniture, appliances, housewares or clean clothing that we can sell in our thrift shops. Our trucks are scheduled for pick-ups on Tuesdays and Thursdays throughout Hernando County. Please call 352-293-5496 to schedule a pick-up. Become a DayStar Volunteer. We need help in the office, Thrift Shop sorting and assisting on the trucks (not driving). You can help one day a week for a 4 hours. You can also help once or twice a year on special projects. Come and Buy Something at our Thrift Shops. We are located ¼ mile on Hope Hill Rd behind St. Anthony’s. Our current hours are Thursday, Friday and Saturday 9:00 AM to 1:00pm. Need Directions Click Here for a Map. Clothes, Appliances, Furniture and More! DayStar’s food pantry regularly donates to other local charities with extra bread and pastries when there is an overabundance, including Joseph's House, Jericho Road Ministries, Dawn Center, Love Thy Neighbor, and Forest Oaks Lutheran Church. The food pantry provides for example, a family of four, meat, butter, bread, pastries, and non-perishable items that equal 37 pounds of food. This is a substantial amount of food, by any food pantry standard. Last Thanksgiving, DayStar was able to provide holiday food for over 400 families. We Purchased 350 Publix gift cards which was generously supplemented by residents of The Hernando Oaks Community. DayStar also partnered with J.A.M., (Jesus And Me) ministry supporting their luncheon program, by providing 150 Brooksville children with toys for Christmas. Daystar also donated twelve boxes of toys for children of the Dawn Center, assuring they had toys for Christmas. We also donate toys to Jericho Ministries and Head Start. For over thirty (30) years, DayStar has been helping the elderly and retired in the community who are living on fixed incomes and are in a day-to-day struggle to maintain a normal standard of living. The DayStar Life Center plans to continue their dedication to helping more people, sharing their abundance through additional outreach projects, and continuing to partner with more organizations in the area. DayStar Life Center is an all volunteer organization helping needy families in Brooksville and Spring Hill, Hernando County. Funding comes primarily from our Thrift Store sales. Our Thrift Stores sell clothes, appliances, books, furniture, home accessories and children toys. 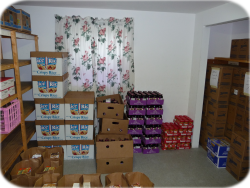 We also manage our own food pantry and provide information to assist families with life's basic needs.